ASK most skiers what they know about Bulgaria and they'll say it's cheap. And they'd be right. 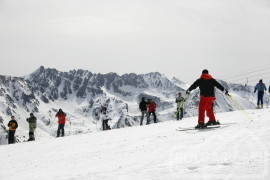 If you're on a tight budget you won't get a better deal on a winter sports holiday anywhere else in Europe. Out of this bargain-hunter's snowy paradise, the historical town of Bansko, in the beautiful Pirin mountain range, has emerged as the champion of Bulgaria's winter resorts, and offers so many thrills a penny you can't afford not to go. Millions of pounds have been spent on facilities in past few years. Chairlifts have been added to link up the two main ski areas, which means snowboarders can avoid tiresome drag lifts. And there's still a lot of development going on in Bansko - most of it near the gondola that takes you from the outskirts of town up to the centre of the ski area. Thankfully the old town remains relatively untouched giving Bansko a quaint charm. Most of the houses are of traditional stone and timber build, and we occasionally saw locals on horse and cart or skating over the icy streets in an ancient Trabant. A ride in the gondola takes less than 20 minutes and the further up you get the more spectacular the view becomes, stretching out over a seemingly infinite forest of huge pine trees. Among which is a 12km ski-road that runs all the way back into town. Snow canons cover the ski-road and floodlights have been installed for night skiing. It's a wonderful meandering run through the pines but there are a few flat sections, so snowboarders need to keep a momentum or end up shuffling along the flats, praying for ski poles. The improved lift network means the variety of runs seamlessly link up and there's plenty to keep you busy no matter what level of ability. Beginners can have great fun on the blue runs, while the many blue and red runs make Bansko an intermediate's dream. And the relatively quiet pistes mean you can bomb down some blue sections at speeds you probably shouldn't be attempting. Even some of the reds will have lily-livered intermediates quaking in their boots. But if it's more thrills than sheer speed you're after, then catch some air on the ramps and bumps of the new funpark area. Bankso has a good record for the white stuff and there can be crisp snow until early May. The lift queues are minimal, thanks to a new hands-free, chip-card lift-pass. No rummaging in pockets, just wear the card on your left and as you walk by the turnstile sensor the gate opens. You can hire ski gear from the centre at the base of the gondola, and leave it there overnight. To refuel during a day on the slopes, stop off at one of the restaurants and snack bars on the mountain. Tuck into belly-warming soups, tasty barbecued kebabs or a three-course meal. The best place to enjoy the apres is the newly-built Happy End pub - located at the end of the ski-road. We found it impossible to walk past without slipping in for a tot or three of the local brandy - eye-popping firewater traditionally served hot, There's live music at the weekends when the place fills up with young professionals from Sofia. For a more traditional atmosphere, head for one of the many Mehana taverns, where you can gulp the local beers for as little as 50p a pint. And if you're self-catering, you can venture into the old town to try some of the local dishes. Bulgarian cuisine has similarities with Greek and Turkish. Specialities include the Bansko-style kapama, a tasty mix of meats and veg stewed in an earthenware dish. You can get a two-course meal for about ? ?5 a head, and a local red at ? ?2 a bottle. Nightlife can be found in some of the more modern bars in town. There's the inevitable English bar - The Lion, with live football screenings and imported English beer. There's also a lot of investment going into new accommodation around the gondola station. The plush five-star Hotel Kempinski has just been built right on the slope, and smaller hotels and apartment blocks are popping up all over. We stayed in the four-star Hotel Perun, a 5-10 minute walk from the gondola station. The hotel's steamroom and Jacuzzi were a welcome relief after a day on-piste. There's a laid-back atmosphere in Bansko, with mainly Russians, Germans and English. Seasoned skiers won't find the size of ski area they're used to in the Alps, but if you're on a budget, give Bansko a run.